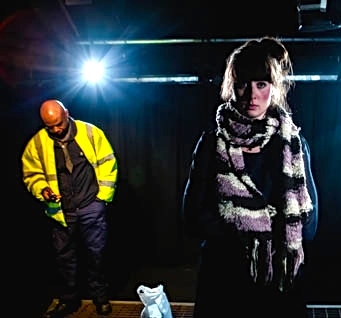 Vinay Patel sets his play in a soulless wasteland, neither urban nor rural, where transport links scar the landscape and the only signs of humanity are glimpses caught through the windows of passing vehicles. Specifically, this is a high platform on the Dartford Crossing, where Andrea (Molly Roberts) has come to end it all, having decided that she is of more use dead than alive to those close to her. Roland (Maynard Eziashi), a toll booth superintendent, has other ideas; he has spent many shifts watching as distant black dots plunge from on high into the polluted Thames estuary, but, on this occasion, he climbs up to find out more. This is not the first drama to ask the “to be or not to be” question and over-familiarity, particularly in the early stages, is the biggest obstacle in the way of Patel’s play gaining a grip. Once the play settles into a predictable battle of wills between Andrea and Roland to gain the upper hand, it strays into the territory of light comedy, as the banter ranges from old television programmes to brands of supermarket ready meals. This goes on for much too long, but, as it becomes clearer that Roland, in a dead-end job and with a fragmenting family, has problems which mirror Andrea’s, the drama builds to a powerful and distinctive climax. This production, directed by Bethany Pitts for Polaroid Theatre, is lifted by two exceptionally strong performances, whilst Petra Hjortsberg’s simple stage designs and Ben Jacobs’ atmospheric lighting are effective in suggesting a bleak and hostile environment, in keeping with the writer’s themes. We are frequently told that the World would be a better place if it was run by women, but Deborah Bruce suggests differently in her sparkling new comedy, which sees three 40-ish mothers descend into total panic, whilst the only voices of sanity are those of the men and a teenage boy. When Bea suffers a crisis of confidence in her abilities as a mother, she abandons her partner and two young sons in Australia to seek comfort and support from her two closest friends in a South London suburb. The friends are Kate, a domineering control freak and Alex, an alcoholic single mother of three (by three different fathers) who is in a frenzy because one of her sons could be caught up in the 2011 London riots, which are taking place at the same time. Helen Baxendale does well as the dazed and confused Bea, having the thankless task of playing straight woman to the comedy characters all around her. Clare Lawrence-Moody makes Kate an unstoppable force of nature, refusing to take “no” for an answer or even to even hear the word spoken in her insistence that everything will be done her way, whilst Emma Beattie’s Alex tows the line obliviously, consumed by her own problems. The appearance of Alex’s son Liam (Bill Milner) is the comic highlight of Act II; fed up with dispensing Ibuprofen to relieve his mother’s hangovers, he gives the perspective of the offspring and, in trying to impose order, he effectively mirrors Kate. Kate’s long-suffering partner (Daniel Hawksford) and his brother (Oliver Ryan) plead for common sense, but are largely unheard. 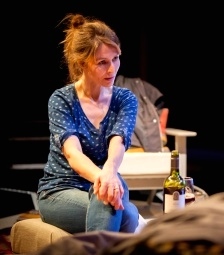 Charlotte Gwinner’s production, performed in the round, moves briskly and Bruce’s writing contains nothing too heavy, but makes many wry observations about the nature of friendship and warns that parenthood is not something to be taken lightly. These are grim times for the Brothers Grimm. They have no more stories to tell and they need our help to scour the streets of Deptford and find new ones. But, to worsen matters, one of them, Wilhelm is suffering from severe depression, making it essential that we find a happy story cheer him up. Teatro Vivo’s theatrical journey, presented in conjunction with the Albany Theatre, is a trek through the streets, shops, bars and back alleys of Deptford, encountering the bizarre and the charming, the pretty and the pretty gruesome, with song, dance and lots of dodgy German accents thrown in along the way. Two parties begin the expedition, taking separate routes and meeting occasionally when two stories connect. Jakob (Mark Stevenson) and Wilhelm (Joel Mellinger), along with their devoted friend Dot (Kas Darley) send us on our way and we soon hear a salutary tale of gambling which leaves us outside the residence of a Mr Paddy Power. We are then ushered to the back of a delicatessen where a wolf (Mellinger again) is sprawled across a sofa, too fat to move; he tells us of his encounter with a young lady in red. Further back, someone’s sister, a not too pretty lady (Sarah Finigan) amputates her big toe in preparation for a shoe fitting and, outside, a rough sleeper named van Winkle is woken from his slumbers as we pass. Yet still no happy stories to tell to Wilhelm. We need a break and head for a bar called The Job Centre, where a lady using a Zimmer frame gives dancing lessons. Then it’s back on the trail and maybe we can help a demented frog (Finigan again and utterly hilarious) to achieve its ambition to be turned back into a prince; sadly, the frog turns out to be into sadomasochism and granting its wish could land us into trouble with the RSPCA. Another unhappy story, but now there is Rapunzel (T’nia Miller) waiting outside Poundland, to offer us a ray of hope. Delightful performances by the five who cover all the roles make this a splendid journey of childish (but not children’s) entertainment which gets better as it progresses. Topical references and quick-witted repartee from them all are a bonus. Of course, clement weather helps too as does the unlikely location of Deptford, quiet in the evenings, but with a few locals around to contribute friendly heckling, particularly as we are walking along the High Street singing a nonsense song in a chorus behind Rapunzel. Inside the Albany, the Brothers eagerly wait for us to report our findings, which hopefully will include that elusive story to lighten Wilhelm’s gloom. And do we all live happily ever after? You bet (well for a couple of hours at least). Thornton Wilder’s 1938 play is performed almost constantly across America, but was rarely seen here until around 18 months ago when it appeared at The King’s Head Theatre, just a few yards away from the Almeida. David Cromer, who has already directed the play in New York with considerable success, now gives us a new version which makes the big statement that, notwithstanding Wilder’s very specific descriptions of place and time, the play speaks just as much to the United Kingdom (and indeed to all regions of it) as to the United States. Of course Wilder’s themes are universal, but Cromer could have assumed that intelligent audiences would figure this out for themselves; instead, he double underlines the point by getting the actors to speak with accents from all parts of these islands, a crass misjudgement which undermines a production with many admirable qualities. Our Town is about families and a community, but, perversely, the characters in this production are not able to gel together as either. Taking the role of Stage Manager (or narrator), Cromer himself brings a strong, nonchalant presence, drawing the audience into the fictional New Hampshire town of Grover’s Corners at the beginning of the 20th Century and introducing us to its inhabitants. Act I (daily routines) and Act II (love and marriage) are played with the house lights on, with actors (in modern dress) and audience mingling and some distant action taking place on a balcony. In accordance with Wilder’s instructions, there is no scenery and this production has only wooden tables and chairs as props. The ambience is just about perfect for the play, but the slow pace and subdued performances, presumably meant to emphasise the mundanity of small town life, work better at some times than at others. In Act II, the nervous proposal scene and the awkward conversation between bride’s father and groom are both funny if read directly from the page, but, here, they are so underplayed that they raise barely a grin. However, with the lights now dimmed, the short and deeply moving Act III (death) is judged beautifully, achieving a sense of stillness that brings out all the writer’s underlying themes relating to the universe, and the place of each individual and community within it. Now Cromer wisely allows Wilder’s fine writing to do most of the work and, even when he defies him by briefly introducing scenery, the effect is memorable. Overlooking things for which the director must take responsibility, the ensemble acting from a company of over 20 is generally excellent. 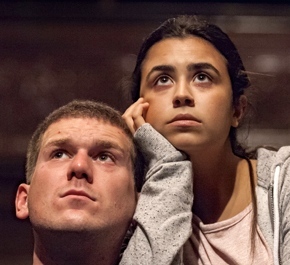 After two viewings, the suspicion remains that, somewhere, a production exists that will reveal this play to be a masterpiece, but maybe there is a better chance of finding it in America than in Islington. This is the first time that I have been to the new theatre here and I wonder if there can be anywhere better for staging a big musical. The audience is seated in a crescent around the traverse stage and, most crucially, the orchestra is where it should be, in a pit front of stage and effectively amongst us. Under the direction of Nicholas Skilbeck, they make a truly glorious sound, transporting us right back to the Great White Way in its golden age. The sound alone makes the journey here worthwhile, but, of course, Jules Styne has given the musicians something pretty marvellous to play, with a score that stands alongside the very best. 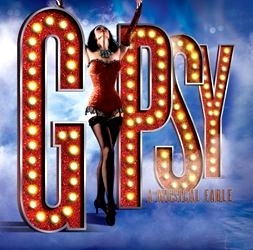 Gypsy first appeared on Broadway in 1959 with Ethel Merman in the lead and, since then, it has been revived there regularly as a vehicle for almost every leading musical theatre actress who is old enough to have grown-up daughters. However, it has not been seen in London’s West End since the legendary 1973 production starring Angela Lansbury. That omission must be about to be rectified. Arthur Laurents’ book tells of Momma Rose, a domineering mother of two daughters – the younger, June, is pushed from childhood to become the Vaudeville star that Rose herself always dreamed of being and the older, Louise is constantly put down, used to sew costumes and only allowed to appear on stage as the back end of a cow. When June jumps ship and elopes, Rose turns to Louise to fulfil her showbiz dreams, but, instead of making it big on the fading Vaudeville circuit, she finds tainted success in Burlesque, becoming the stripper Gypsy Rose Lee, whose real life memoir suggested the show. In Rose, Imelda Staunton, that diminutive giant of the British stage, has found the role that she was born to play. A string of formidable stars have tackled Rose before, all no doubt bringing their own touches of brilliance, but it would be surprising if any of them managed to capture both the hard edge and the soft centre of the character quite so perfectly. In the first half, she makes Everything’s Coming Up Roses a barnstorming hymn of hope and optimism, but when she reprises it towards the end of the show, she stands alone on the vast, bare stage and, with Rose now made a bystander by the very success that she had dedicated her life to achieving, Staunton exposes every line of the lyrics as a delusion, a mere mask for all Rose’s hollow dreams. At the end of the reprise, she steps forward to take her bows in a supposedly empty auditorium, but, inevitably, the illusion is ruined when the real-life audience, many standing, gives her a thunderous ovation. This is a head-dizzying, heart-pumping, eye-watering piece of pure theatre that will be etched in the memory forever. All that said, this is not a one-woman show. As the girls’ long-suffering agent, Herbie, Kevin Whately is extremely effective. Perhaps due to his familiarity from television, he brings the key quality of likability which is perfect to set against the hurricane force of Rose and his gravelly voice sees him through two great duets. Lara Pulver was the vamp who pierced the supposedly impenetrable heart of Sherlock on television and she assumes a similar guise here as Gypsy, but only for the show’s last quarter. The joy of her performance is seeing Louise’s transformation from a sweet, shy, neglected girl, eventually adding a new layer of confidence for every layer of clothing that she removes. She sings beautifully too in a performance that, in almost any other show, would be the star attraction. Coming two year’s after West Side Story, this is the last major hit for which Stephen Sondheim wrote only the lyrics and his collaboration with Styne produces one magical song after another throughout the show. Jonathan Kent’s direction and Stephen Mear’s choreography are packed with so many fine details that it feels as if at least one more viewing will be necessary to take them all in and what a chore that will be. Alan Rickman must have chosen this for his second film as a director out of nostalgia for his glory days on stage in Les Liaisons Dangereuses. Watching the film feels a little like gatecrashing a fancy dress party, seeing an array of recognisable thesps all prancing around in lavish costumes and wigs – except for Kate Winslet whose hairstyle could have been the inspiration for the film’s title. Winslet is summoned to the court of Louis XIV to build a garden at Versailles (presumably Alan Titchmarsh was otherwise engaged) and falls for her boss, played by Matthias Schoenaerts, a star of French films who affects a near-perfect English accent to play a Frenchman (fair enough, he’s actually Belgian). She also falls foul of the wicked Helen McCrory – after Cheri Blair, Medea and this, surely Cruella deVil must be next for her – and Rickman himself gives us a sinking Sun King. Some of this is actually intended to be funny, particularly whenever the splendid Stanley Tucci appears as the Comte de Something, sending it all up mercilessly in a performance that seems a little like an impersonation of Rickman. It all adds up to the most memorable British account of French history since Carry On, Don’t Lose Your Head. On the plus side, this is possibly the best film about gardening ever made and, maybe not for all the right reasons, it turns out to be a real guilty pleasure. An uneasy mix of human drama and action thriller, this fact-based film centres on child abduction in modern China. A divorced couple (Huang Bo and Hao Lei), living in Shenzen, scour the country for their missing boy and become involved with a support group of parents with similar plights. The plot has several surprising twists, some seeming less true to life than they probably are and it meanders far too much in the final quarter, which is saved only by an excellent performance by Zhao Wei as a foster mother. Nonetheless, the film, beautifully shot and well acted, always holds the interest. Bennett Miller’s excellent Moneyball probed the grubbier side of Baseball and he now turns his attention to Olympic Wrestling with an astonishing true story. Channing Tatum and Mark Ruffalo play brothers in the US team preparing for the 1988 Seoul games; both are enticed under the wing of John du Pont, a self-deluding billionaire “coach”, who describes himself as “ornithologist, philatelist, philanthropist” and is obsessed with impressing his dying mother (Vanessa Redgrave). Beginning as a sports movie, the film turns into a damning indictment of the corrosive effect of excess wealth in American society. The driving force is a creepy performance by Steve Carell as du Pont that has the word “Oscar” written all over it. Totally absorbing from first minute to last, there will not be many better American films in 2014.! Timothy Spall’s magnificent performance is the centrepiece of Mike Leigh’s film, which is as finely detailed and richly textured as a great oil painting. He plays the artist JMW Turner, grunting his way through many scenes, but dialogue is often rendered superfluous when all the characters, even the minor ones, are so vividly drawn that we feel as if we know them personally. Leigh regular Lesley Manville appears only in a delightful one-scene cameo, which emphasises the artist’s fascination with light. In meatier roles, particularly memorable are Paul Jesson as Turner’s stricken father and Marion Bailey as the homely widow with whom he chooses to spend his final years. This is not the usual story of an artist penurious and unappreciated in his own era; Turner was a celebrity during his lifetime, widely (if not universally) recognised as a genius and fleeting appearances by Constable, Ruskin and even Victoria and Albert underline the point. The background details of early Victorian life are also fascinating, as are images of the landscapes and seascapes which gave Turner his inspiration. To call this film a masterpiece might be to steal one description too many from the art world, but it would not be far wrong. A character in this film points out that hardly anyone used texting on the day of the 9/11 attack, which reminds us just how quickly the social media revolution has engulfed us. This is an ensemble piece telling interlinked stories of relationship problems involving teens and their parents and showing what happens when RL (real life) intrudes on the virtual world. It starts out as a smart modern comedy, but loses its bearings at about half way, becomes serious and opens the door to an array of tired cliches. At least, after all these years, I have finally seen an Adam Sandler film, but maybe I shouldn’t have bothered. Neither completely true-to-life, nor melodrama, nor thriller, but a little of each, the strange mix of genres becomes part of this film’s hypnotic allure. It tells of a Jewish woman (Nina Hoss) who survives a concentration camp at the end of World War II and attempts to rebuild her life, reconciling past with present, thereby reflecting the dilemma of the German nation at that time. A plot that is full of improbabilities includes echoes of Hitchcock’s Vertigo, bringing psychological complexities to the relationship between the woman and her husband (Ronald Zehrfeld) and adding further layers to the slow-paced drama as it builds to an enigmatic conclusion. An intriguing and absorbing film. Jon Stewart (the American television satirist) makes a decent job of telling this story of an Iranian-born western journalist (Gael Garcia Bernal) who returns to his home country to cover the 2009 rigged re-election of Ahmadinejad. Falling foul of the authoritarian regime, he ends up in jail, suffering torture so that he will confess to espionage and be made an example of. The specific details, covering relatively recent history, are fascinating, but, from about a third in, the film follows the path of just about every movie about brutal incarceration ever made and the prevailing feeling becomes one of deja vu. Having scored two huge hits, the Bradley Cooper/Jennifer Lawrence partnership seemed on course to become the new Tracy/Hepburn. Sadly. they have hit the buffers big time, incapable of giving any life at all to this dreadful, humourless costume melodrama. The plot creaks, the dialogue stinks and none of the actors can do more than go through the motions. Shame on the Festival organisers for allowing such a turkey to be included. An Australian heist movie, it starts in prison where a young guy (played by Brenton Thwaites with a fixed look of bewilderment) falls in with the wrong sorts and, on release, he joins a gang out to plunder tons of gold bullion. Ewan McGregor never looks comfortable as the hard man mastermind, but, playing the mandatory girl hanging around to share the spoils, Alicia Vikander (see also Testament of Youth) confirms her status as a big star in the making. First time director Avery mounts some slick action sequences, but the whole enterprise is let down by a screenplay which merely re-works a predictable plot, under-develops the characters and burdens the actors with bland, stilted dialogue. How this very ordinary little film ever made it into the Festival’s official competition is a major mystery. Without wishing to seem disrespectful to the fallen, it has to be said that maybe we don’t need to be told yet another World War I story just now. However, it would be a travesty if commemoration fatigue was to dampen enthusiasm for James Kent’s impeccably crafted film. What makes the story different is that it sees the War from the perspective of a woman, being adapted from Vera Brittain’s memoir of her own experiences. The events depicted are, on occasions, so unbelievable that they could only possibly be true. The story begins in 1914 when Vera, at the vanguard of female emancipation, begins studying at Oxford and it ends in 1918 with her scarred permanently by her experiences and committed to being a lifelong pacifist. A literate script is brought to life by a strong cast of established actors and promising newcomers. Most notable is a wonderful performance by the young Swedish actress Alicia Vikander as the headstrong, determined Vera. This film is a dark horse for the awards season. Will Brits soon make American leading actors completely redundant? Here, Tom Hardy resembles a cross between DeNiro and Stallone, playing Bob, a hard man with a heart who works as a Brooklyn barman for his cousin (James Gandolfini) on the fringes of organised crime. A psychotic killer (Matthias Schoenaerts, taking a break from gardening – see above), a Pit Bull puppy and the Chechen mafia all cause him problems as he struggles to keep out of trouble and get closer to his dog walker (Noomi Rapace). This is a fairly routine crime thriller which is elevated to a higher level by Hardy’s mesmerising performance. Playing an autistic genius hardly takes Benedict Cumberbatch outside his comfort zone, but he is excellent as a man who found the way to beat the Nazis and invented computers as a by-product, yet fell victim to a very English form of fascism. This film is a stirring if belated tribute to AlanTuring, now rightly recognised as a national hero. When the first four faces you see on screen are Cumberbatch, Rory Kinnear, Mark Strong and Charles Dance, you know you are in safe hands and, in a very impressive cast, only Keira Knightly looks a little out of place, playing a Maths wizard working alongside Turing who becomes his “fiance of convenience”. She typifies the Hollywood-style gloss that occasionally threatens to swamp the film; however, the superb writing and acting always win through. 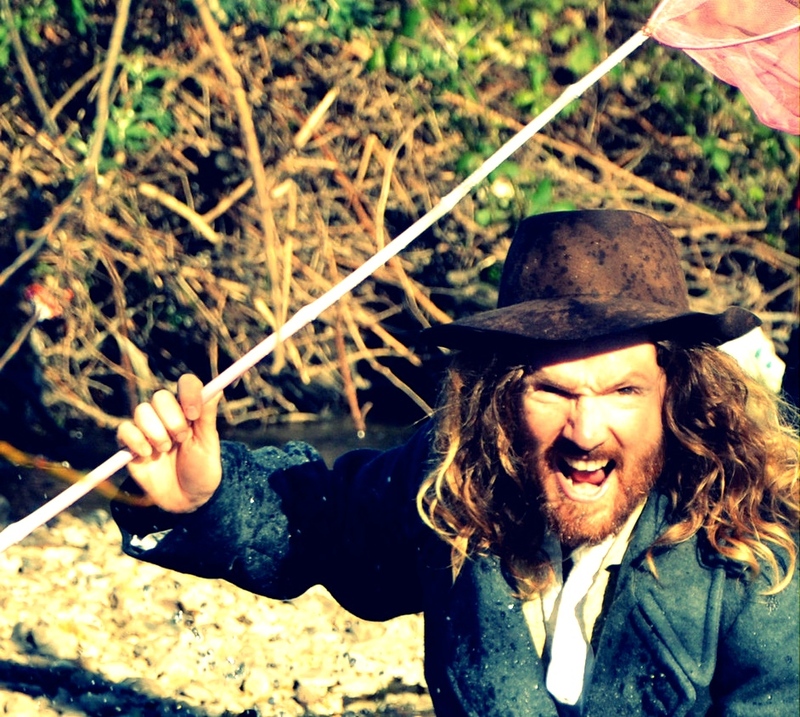 An odd choice of subject for a young British director, this film creates a post-apocalyptic vision of a civilisation broken and lawless in the wake of the American Civil War. There is much to impress, including the leading performances. in an account of the struggle of three women to overcome the odds and survive. However, the central narrative thread is weak and the relentlessly grim brutality becomes very wearing. Francois Ozon moves into Pedro Almodivar territory for this gentle comedy. The first 20 minutes seems like an abridged version of Beaches and then, barely giving us time to wipe the tears from our eyes, Ozon springs the first of several surprises which it would be unfair to reveal. With two very strong central performances from Anais Demoustier and Romain Duris, the film first embraces and then celebrates human diversity. It is all deliciously audacious and it manages to be both funny and touching. Many nationalities (Danish, Scottish, Welsh and French spring immediately to mind) feature in the cast, Eric Cantona as number two baddy (thankfully with no more than a handful of lines to speak) being one of the more notable oddities. To be fair, this could be a reflection of the fact that many nationalities did indeed emigrate to the American West in the pioneering days. After a misleading start, the film turns out to be a revenge western in the Leone/Eastwood mould, a straight fight between the good, the bad and the ugly in which few in any of the categories are left standing at the end. A promising plot line is introduced with the suggestion that the gang terrorising a town is just a front for big oil corporations, but, sadly, this leads nowhere and cliches continue to abound in a film that would have been routine 40 years ago, but now has appeal only because of its novelty value. JK Simmons is terrific as the hard-hearted, bullying monster mentoring an aspiring jazz drummer (Miles Teller). The film follows a well-used formula, but still springs surprises and, even when the strings tugging at our emotions are clearly visible, they still do the trick. Lots of great jazz music is the icing on the cake of a film that is not too demanding, but provides top class entertainment. On the face of it, a film in which a character played by Reece Witherspoon treks hundreds of miles along the Pacific Coast Trail of California in order to “find herself”, is one to avoid at all costs. This is a road movie with few cars, but most of the interest in Nick Hornby’s intelligent screenplay arises from flashbacks to the woman’s earlier life. Witherspoon reminds us that she once won an Oscar and Laura Dern also gives a moving performance, with the result that the film rises well above the ordinary. To avoid confusion, Jacques Brel died in 1978 aged 49, near to Paris and no suggestion is being made of his resurrection. This show is a revue of the Belgian-born singer/ songwriter’s work which first appeared in New York in 1968 and was revived there with great success in 2006. It was last seen in London in 1997. Chris de Wilde’s set resembles a shabby Parisian night club, with a five-piece band on stage and tables at the front of the stalls. The ambience that this creates makes an instant suggestion that the show could be best enjoyed with a full glass of wine to hand, giving encouragement to wallow in the melancholic music. Using Eric Svejcar’s arrangements, Dean Austin’s band, often featuring prominent accordion, gives the evening a distinctive French flavour. Brel’s lyrics reflect lives well-lived and hard-lived, enriched by love and loss, tenderness and pain, passion and despair. In Brussels, he tells of childhood frolics and the company dances like marionettes, dressed in Chaplin outfits. 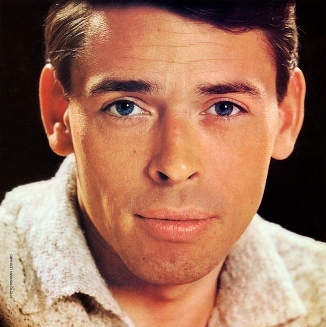 But Brel’s childhood was to be interrupted by war and his music career was to develop in its aftermath. In Statue, a dead soldier comes to life to rebuke those defacing his memorial, a mother laments for her lost boys in Sons Of and, in Next, a young man rails at the indignity of conscription. The spectre of World War II hovers above many of the songs in this revue, yet Brel’s chief preoccupation seems to be with the emotions of ageing. In the bleak Old Folks, he writes of old people in the third person, but in most of his lyrics, he reminisces in a very personal way, showing a remarkable understanding of an age group that he, himself, barely reached. Fittingly, the company is made up of two performers in middle age and two younger, all have their own solo highlights and combine well with each other in duets and company routines. These are four accomplished actors who sing well, but, more importantly, they milk the songs for their dramatic effect, aided by choreography from Sam Spencer-Lane. David Burt, looking dishevelled and world weary, recollects the raucous days of his youth, when he was called Jackie; speaking some lines, finding all the gravel in his voice and varying the tempo, he gives a unique rendition of the song, as different as it could be from the famous Scott Walker version. Later, he offers comedy, rising repeatedly from his own coffin to sing Funeral Tango. Eve Polycarpou brings maternal warmth and, in all her songs, she rises to the crescendos in the style of Piaf. Particularly striking is her delivery of Brel’s best known song, If You Go Away, which she sings in French (Ne Me Quitte Pas), sitting on the edge of the stage strumming an acoustic guitar, whilst back projection shows passengers leaving Charing Cross station. Gina Beck creates an image of tarnished innocence, singing I Loved with resentment towards a man who cheated on her, but finding the resilience to end the song with “I forgot his name” and, later, with My Death, she faces up with resolution to her own mortality. After the passion shown in Statue, and the rage of Next, Daniel Boys gives a memorable, tender interpretation of the beautiful love ballad, Song for Old Lovers, showing clear joy whilst celebrating a relationship that has come through turbulence and survived. There are lighter songs, but, in general, they work less well than the poignant ones and the show ends with an anthem of hope as the company joins together for the slightly corny If We Only Have Love. Jacques Brel is rarely heard these days and Andrew Keates’ confident, well performed production gives us a welcome reminder of a great talent.